Do you have a job opening, product or service you'd like to advertise to Genetic Counsellors? 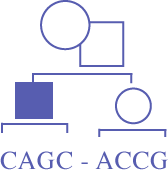 The CAGC offers a variety of ways for you to access our members! To post a job opportunity on the CAGC member job board complete the online form located here. To send an email broadcast to CAGC membership (job posting, event notices, etc.) complete the same form indicating "Emailing PDF to CAGC Office" in the summary section of the form and then email the PDF to cagcoffice@cagc-accg.ca. Interested in partnering with the CAGC to help develop and produce new webinar content in a sponsorship capacity? Please see the Education Partnership Proposal Application Form for further details and instructions on how to apply. Need more information? Contact the CAGC head office at cagcoffice@cagc-accg.ca. Note that all advertising sent to CAGC members is subject to review and approval by the CAGC Membership committee. NSF cheques will incur a $25 service fee.